The Legend of Zelda: The Wind Waker (ゼルダの伝説 風のタクト, Zeruda no Densetsu Kaze no Takuto, lit. The Legend of Zelda: Baton of Wind) is the tenth installment of The Legend of Zelda series. Since Link's debut in 1987, all of his games have been based on universally appealing adventures that continue the series' triumphs of gameplay, presentation, innovation, artistic direction, and fun. 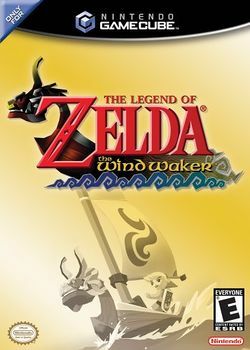 The Wind Waker is the first Zelda game for the Nintendo GameCube, and it features one of the first implementations of cel-shaded animation in video games. The stunning cel-shaded graphics give the people and places of Link's watery world a wildly artistic new look. And, for the very first time, Link sails freely on the high seas! Although the game implements a vastly different graphical style, The Wind Waker stays true to its glorious heritage of seamlessly combining the classic sword-swinging action, perplexing puzzles, and stirring story lines that have made previous Zelda games so great. The Wii U version, titled The Legend of Zelda: The Wind Waker HD, was released for Wind Waker's 10th anniversary. It improves the game's resolution so that it looks great on high definition screens. Additional features include changes to gameplay progression, increased sailing speed, and Tingle online. Integration with the Wii U tablet also adds control changes when using items, the map, and game options. Set hundreds of years after the events of Ocarina of Time, The Wind Waker finds the hero Link in a sea scattered with several islands, which necessitates frequent sailing and naval combat. Link lives with his grandmother and younger sister Aryll on Outset Island, one of the few inhabited islands in the Great Sea. The people of the Great Sea pass down a legend of a prosperous kingdom with a hidden golden power. An evil man found and stole this power, using it to spread darkness until a young boy dressed in green sealed the evil with the Blade of Evil's Bane. The boy became known as the Hero of Time and passed into legend. One day the sealed evil began to return, but the Hero of Time did not reappear. The inhabitants of the Great Sea are unsure of the kingdom's fate, but it is clear that this legend is the story of The Legend of Zelda: Ocarina of Time. When children of Outset Island come of age they are customarily dressed in green, like the Hero of Time. The elders hope to instill the courage of the Hero of Time. It is Link's birthday as The Wind Waker opens, and he receives the familiar green clothes and cap. Aryll's present to Link is permission to use her telescope. As he looks through the telescope, he sees a large bird, the Helmaroc King, carrying a girl to a nearby forest. After retrieving a sword, Link sets out to investigate. Link rescues the girl, only to have Aryll kidnapped by the Helmaroc King as he returns. Needless to say, Link sets out to rescue her. The control scheme of The Wind Waker is largely unchanged from Ocarina of Time and Majora's Mask. Link's basic actions of walking, running, attacking, defending, and automatic jumping at ledges are retained. Link also uses the control system introduced in Ocarina of Time that allows him to "lock-on" to an enemy or other target. An addition to this basic control scheme is the ability to parry. When Link is locked-on to an opponent and not actively defending, certain attacks by the opponent will trigger a visual cue, a vibration of the controller, and a chime. Attacking at that point causes Link to dodge or parry then counter-attack from the rear. This tactic becomes crucial for defeating armored enemies or bosses. The new art style used in The Wind Waker gives Link eyes that are much larger and more expressive than in previous games. This allows Link to focus his gaze on approaching enemies or important items. For example, if Link needs to solve a puzzle by lighting a torch to set a distant object on fire, his eyes might turn to look at a nearby stick, giving a hint to an observant player on how to proceed. As with all Zelda games, The Wind Waker features several dungeons — large, enclosed, and often underground areas. Link battles enemies, collects items, and solves puzzles to progress through a dungeon, fighting a boss at the end. To complete a dungeon, Link primarily uses a sword and shield. Other weapons commonly used by Link include a bow and arrow, a boomerang, bombs, and a grappling hook. Certain enemy weapons can be picked up and used, a feature new to the Zelda series. North American HD box art, front. EU and Japanese HD box, front. This page was last edited on 7 February 2017, at 01:52.